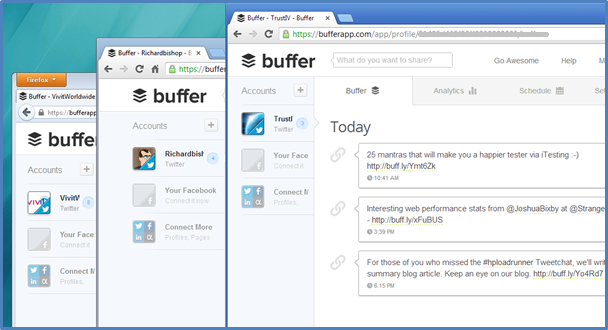 If you’re a user of social media, you may have heard of the social media tool called Buffer. In case you haven’t, it’s basically a sharing and scheduling tool which “buffers” outbound tweets and then sends them in the future. I use it for Twitter, but it can also be connected to Google+, FaceBook, LinkedIn and so on (if you have a premium account)…. For me the free one works just fine. Buffer differs from other Twitter scheduling apps because you don’t have to manually schedule tweets, you set a timetable for when you want tweets to go out and Buffer automatically tweets at the predetermined times. Through Firefox, Chrome or Safari browser plugins (not IE … yet). This is great and I’ve noticed more activity and engagement from my followers since I used Buffer. Unfortunately, I couldn’t think of a way to populate multiple Twitter accounts without paying for the premium version….. until now. As you can see from the screenshot above, I have access to three Twitter accounts. My own account @richardbishop, my company account @TrustIV and the @VivitWorldwide account. By logging into Twitter in three browsers, I can stay connected to each of them and use the different plugins to populate my Buffer. In the screenshot above, I used Chrome, Chrome Canary and Firefox and installed the Buffer plugin in each of them. This allows me to paste Tweets between the browsers if I want the same message in multiple accounts or post to individual Twitter feeds if I want to. Each of my accounts has a different schedule and it is possible to share my non-personal Buffer account with the other users of the @TrustIV and @VivitWorldwide Twitter accounts. On Thursday 6th December at HP Discover in Frankfurt, Jason Kennedy, Martijn Stuiver and I were asked to discuss how Vivit is changing from a primarily US-centric, practitioner-focused user community to one which helps support our members as the IT world changes around them. 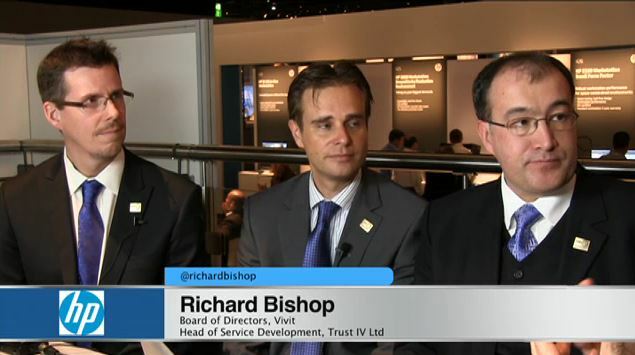 The interview covers the changing demographics of the Vivit user community, how we plan to alter our content to suit our membership, our development of new social media channels, the growth of our membership as well as the development of new special interest groups such as “Cloud Builders” and “Security” alongside our existing special interest groups. For some time, I’ve been using IFTTT (if this then that) to simplify my online existence. For those of you who don’t know IFTTT is a free online service that monitors various information feeds and takes action when particular condition is met. IFTTT describes these rules as “recipes” and a variety of different triggers can be used to prompt an action. IFTTT supports a variety of channels which can be used as triggers. Some are relatively simple such as date/time triggers; for example you may want to receive an email a few days before an important birthday. Others are more complex; for example you could use a trigger to notify you by SMS when you’re tagged in a Facebook photograph. Users can share recipes that they create with the wider IFTTT user base. I’m a director of Vivit, the HP Software User Group and one of my responsibilities is social media, this means that I share some responsibility for the Vivit website. Last week I was on holiday when the site suffered a temporary outage. This was due to a hardware failure and was rapidly resolved by our hosting provider. This got me thinking about how I could ensure that I received alerts when I didn’t have access to my Vivit email account. Our site uptime is monitored using a free service from monitor.us and various Vivit directors receive email alerts in the event of a problem. I wanted to ensure that as well as the emails, I received SMS notifications of these problems. I already had a gmail account and I arranged for email messages from monitor.us to be forwarded to my Gmail account. I gave IFTTT access to my gmail inbox and created a recipe to ask it to look for emails from [email protected] (this is the account used by monitor.us for alerts). Now each time that I receive an email alert, I get an SMS. IFTTT checks my email every 15 minutes, which is more regularly than I check my own email. I have found this to be a pretty good way of keeping informed about problems.